Government launched a portal e-Rashtriya Kisan Agri Mandi (e-RaKAM) which will provide a platform to sell agricultural produce. e-RaKAM is a first of its kind initiative that leverages technology to connect farmers of the smallest villages to the biggest markets of the world through internet. 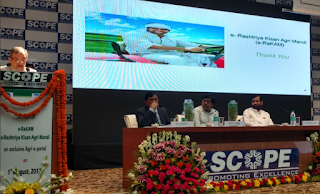 Food and Consumer Affairs Minister Ram Vilas Paswan and Union Minister of Steel Chaudhary Birender Singh jointly launched the portal in New Delhi on 1st July 2017.
e-RaKAM is a digital initiative bringing together the farmers, PSUs, civil supplies and buyers on a single platform to ease the selling and buying process of agricultural products. The farmers will be paid through e-Payment directly into their bank accounts.